I should be on my guard when an observing run gets off on the wrong foot. Not that I thought I was putting that wrong foot in it at first. 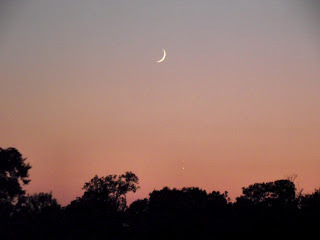 The last new-Moon Saturday looked like it was gonna be a nice one. Dry and cloudless, as dry and cloudless as it’s been down in the swamp in a right smart spell. I gave myself plenty of time to gather up all my stuff in leisurely fashion and position it in the front parlor. Did not get all sweaty and stressed in the process of loading Celeste, my C8, and the CG5 mount in the car. Grabbed a bottle of water, hollered to Miss Dorothy “Honey, I’ll probably be pretty late,” and pointed the car west toward Tanner Williams and the PSAS dark site. What could happen? As I said not long back, I always forget something. I know that, so I run through the equipment inventory in my head as I’m leaving. If I had half a brain, I’d use the gear checklist I made up a while back, but I yam what I yam, I reckon. About a block from home, I suddenly realized I’d forgot the Astrogizmos red filter I put over the netbook screen. When I’m doing Stellacam deep sky video, as I’d be doing on this night, my night vision doesn’t matter much, but I try to be as considerate as possible regarding spurious light so as not to disturb my fellow PSASites. I turned the car around, grabbed the filter, set out again, and all was well. But I started wondering whether this misstep might be a bad omen. It occurred to me as I was pulling into the PSAS dark site that the red filters weren’t the only thing I had forgot. The Bahtinov mask I use for fine-tuning focus was sitting back in Chaos Manor South. Not a big hit. I love the (Farpoint) Bahtinov, since it helps ensure my focus is on the money every time, which is important with the Stellacam’s smallish chip, but I’ve focused astro-cameras for years without one, so I figured I’d endeavor to persevere. I did resolve that enough was finally enough. From here on out I go back to using my checklist. When I was done with my disconsolate and peeved muttering about the Bahtinov mask, I focused a weather eye on the sky. Not bad, not bad at all. There was a little haze, but not much. Way down on the western horizon there were some clouds, but they were skittering off and it was evident it was gonna be a good night. Maybe a real good one. There was also a young, slim Moon in the sky, but she was following Sister Venus into the gloaming, and wouldn’t be a problem. Everything would likely have gone like clockwork if I hadn’t got ambitious. I would, as last time out, be using my 1995 Ultima C8, Celeste, on my beloved CG5 mount under the control of NexRemote, which takes the place of the NexStar hand controller. NR allows you to select the telescope firmware version you want to use, with version 4.16 being the latest offered for the CG5 GEM in the current build of NexRemote. Not that I normally use 4.16. I’ve stuck with v4.13. What’s so different about 4.16? Celestron redid the polar alignment routine. 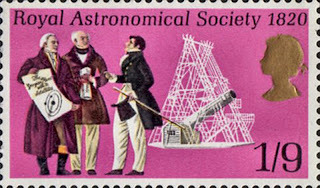 The old version points the scope where it assumes Polaris will be given a perfect polar alignment. You then adjust mount altitude and azimuth till the North Star is centered in the eyepiece, which yields a polar alignment more than good enough for the Stellacam’s 10-second exposures. All-star is, however, superior, or so I’ve been told. In addition to allowing any star—well almost any star—to be used for polar alignment, it is reputedly considerably more accurate than the Polaris routine. I’ve been happy with the old software, but, hey, if that elusive More Better Gooder is available for free, why not take advantage of it? While I’d tried this new software once, briefly, down in Chiefland, I hadn’t really got comfortable with it. Since there would be neither Herschel I nor Herschel II objects available this evening, I figgered this would be the perfect time to give 4.16 another try. I reviewed the All-Star instructions (which have still not been included in the CG5 manual) one more time as the Sun sank. Didn’t seem too hard. Main difference is that you now access polar alignment from the Align button instead of the Utility Menu. To begin the procedure, you send the scope on a go-to to a named star. This star should, according to Celestron, not be near the eastern or western horizons and should, if possible, be high in the sky near the Local Meridian. Hmmm…lessee. Well, there was Altair shining his little heart out. He was, if not at culmination, at least near it, and since he’s almost on the Celestial Equator, I figured that qualified as "high in the sky." Despite the All-Star directive to choose a star “high in the sky,” they also caution you to avoid one “directly overhead.” Altair was high, but not right overhead, and I guessed it would be as close as I could get to complying with the somewhat ambiguous instructions. 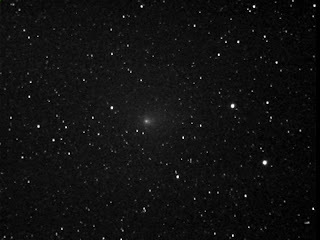 Once I had Altair in the field and carefully centered, it was time to begin polar alignment by pressing the Align button and scrolling to and selecting “Align Mount.” When I hit Enter, the scope re-slewed to Altair, and following instructions, I centered the luminary in my finder and then in the field of my 12mm reticle eyepiece. So far, so good. The final step is to press the Align button, which first syncs on the star and then slews the scope to the place it believes the star should be given a perfect polar alignment. Then, just as in the old Polaris alignment procedure, you recenter the star in the main scope using the mount altitude and azimuth adjusters (never the R.A. and declination buttons). That’s when doubt began to creep in. I did not like what I was seeing. The place the mount slewed to was a good ways from Altair. By Herculean effort, I got it in the field with the alt/az screws. Sure seemed like I was lowering the polar axis a whole lot, though. Wouldn’t have thought that would be necessary, since I’d put Polaris smack in the hollow bore of the polar axis before I began my go-to alignment. Maybe with Altair high in the sky it just seemed as if I were having to move the star a long ways due to my uncomfortable perspective. 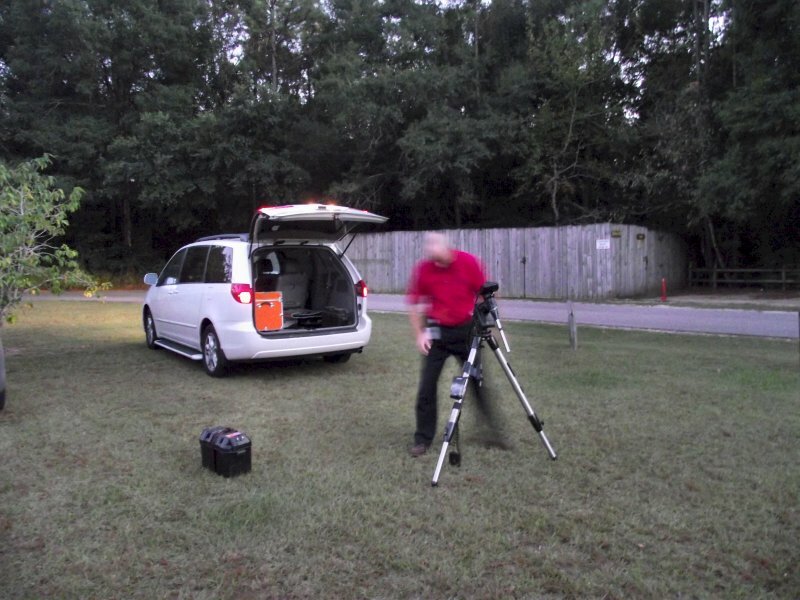 The NexStar ought to know what it was doing, oughtn’t it? What next? I’ve been told that if you do the All-Star procedure correctly, there should be no need to re-do your go-to alignment. In line with my usual thinking, though, “trust but verify,” I decided to check the mount on one object before setting up the Stellacam. Off to M13. Nope. Nada. Zip. Zilch. Hokay. The instructions caution that this can happen, and suggest unsyncing the All-Star star, replacing alignment stars, yadda-yadda-yadda. I just hit the big switch and redid my go-to alignment, adding Calibration Stars until one (the third one) was in the field of the main scope when the slew stopped. Alrighty then, “M13.” There she was near the center of the field. I was good to go with 4.16, right? Hah! 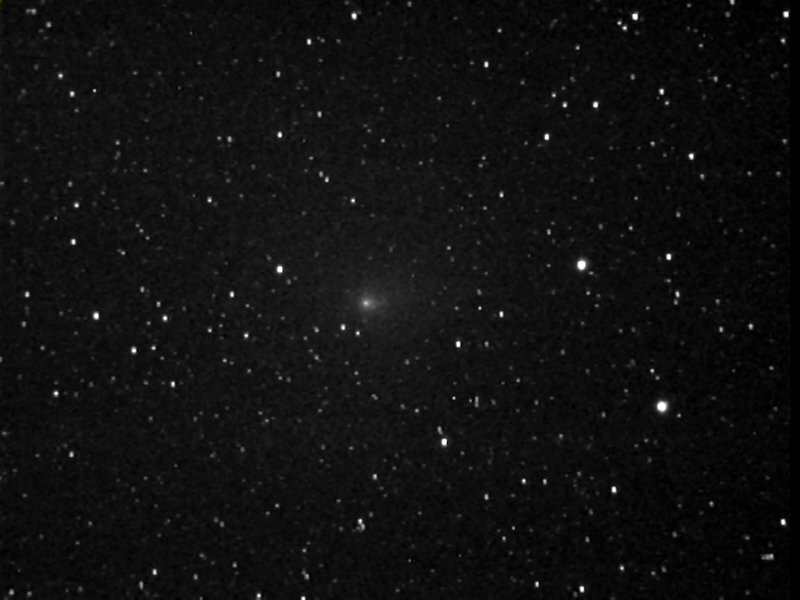 Got the Stellacam II hooked up, SkyTools 3 running, and focused as best I could on M13. Why “as best I could”? It’s a little hard to focus on a moving target. No, the CG5 is not an AP1200, but with the HC polar align procedure done, you get round stars with the video camera’s short exposures. Except I wasn’t getting that. Even if the stars were near-round on a single frame/exposure, I could see something was wrong, since they moved a considerable distance on the screen when the Stellacam’s image was refreshed with the next exposure. Hmmm… What to do? Well, maybe it was just that I was pointing fairly high in the West to get at M13. Perhaps poor balance was making the CG5 tracking a little less good than it usually is. There is no doubt balance is important with a GEM in this class. But… What I was seeing looked a heck of a lot worse than that. It looked like bad declination drift, an artifact of poor polar alignment. Nevertheless, I pushed on to the first object of the evening. I’d already wasted too much darkness fiddling around with the scope. Yeah, I decided to just put up with the mis-tracking if I could. After a few objects, I decided I couldn’t. Hell, the progress of stars and DSOs across my monitor was making me dizzy. I’d already wasted a lot of time and didn’t relish wasting more, but it looked like the whole run would be a waste if I didn’t do something. I returned to NexRemote’s settings screen and cycled power on the mount. At the NR settings display, I used the pull-down menu to choose my software build—one of the beauties of NexRemote. You can bet I didn’t pick 4.16; I went back to the tried and true 4.13. Yeah, it was a pain: do a go-to alignment, complete the old-fashioned Polaris polar alignment routine, and redo the go-to alignment (mandatory with the old software). I’d probably burned close to an hour with little to show for my work. What was done was done, though, and at least now when I sent the scope to M13 it was not only centered, it stayed centered exposure to exposure. With the mount finally running right, it was time to get to work. At least it was good and dark now, and despite some lingering haze the Milky Way was obvious overhead. Where to begin? SkyTools said no Herschel Is or IIs I need were available, so it was back to the Big Enchilada, the whole list, the Herschel 2500. As in the past, I will not try your patience by describing every cosmic dust bunny I visited in my trek across Aries, Andromeda, Pegasus, and Triangulum, but I will mention a few of the outstanding objects—75 all told—I visited on this run. As per usual, “POSS” is the Palomar Observatory Sky Survey, galaxy morphological types are where possible given according to the de Vaucoleurs system, matter in italics was transcribed from my log audio recordings, and images (except Hartley 2) are from the POSS. There are a couple of references below to NED. Who or what is “NED”? I’m a-talking about the NASA Extragalactic Database. If you are a galaxy hound, you owe it to yourself to try this wonderful tool. Just about any island universe in the sky is there, and there are reams of data and images for every fuzzy. Best of all? IT’S FREE! Pegasus was high up and out of the light dome, so to his awesome Great Square I went. 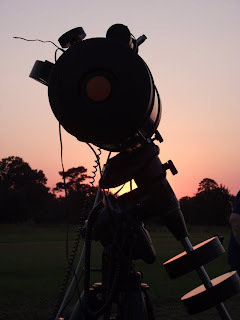 I’m just amazed, y’all, at how the summer observing season has flown by. It hardly seems possible the fall constellations are riding high and the winter ones on the rise before a night is out. Sigh. I must be getting old. 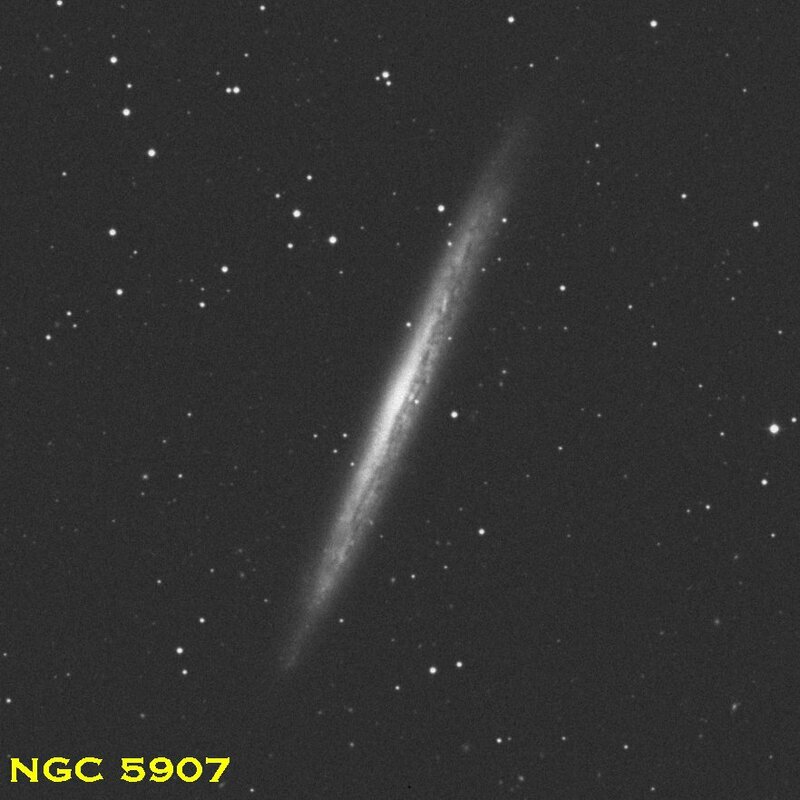 NGC 7550 (H.III.181) is set in a lovely little field. The galaxy itself is a magnitude 13.1, 1.5’ x 1.3’ E-S0 elliptical. 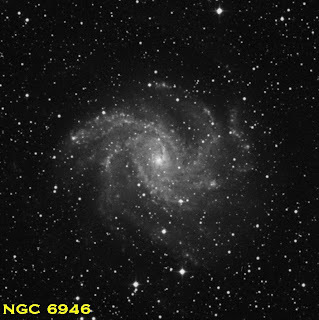 In addition to it, there is a nice looking barred spiral, NGC 7549 about 5’ to the North; NGC 7558, an elliptical, is a bit less than 6’ to the east; and another barred spiral, NGC 7547 is 3’ to the west. Together, this small galaxy group is known as Hickson 93. Sweet. A magnitude 14.2, 2.2’ x .6’ edge-on Sbc spiral according to N.E.D., NGC 52 (H.III.183) is right attractive. 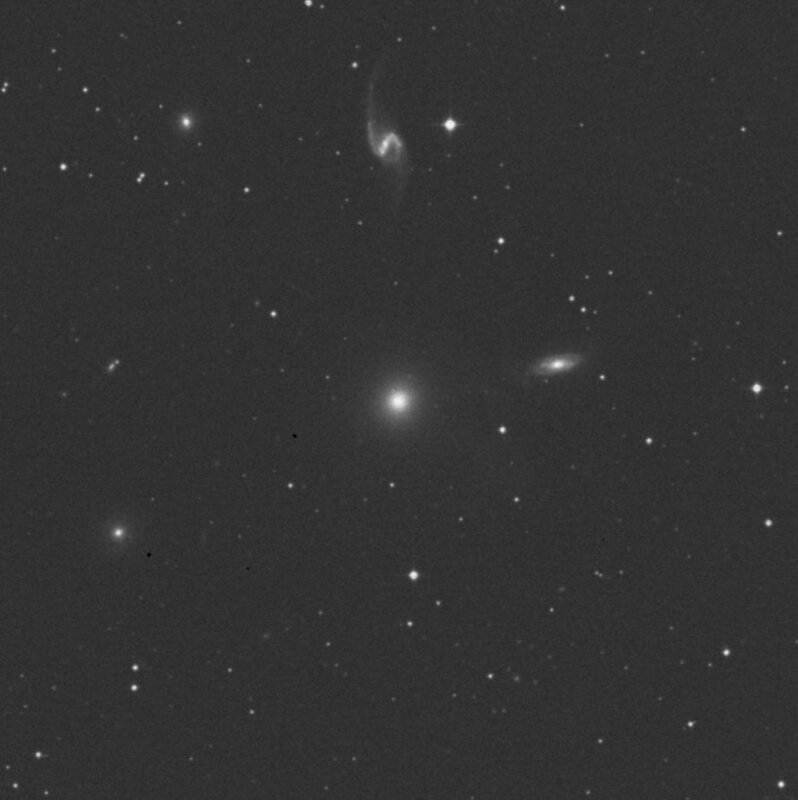 On its POSS plate, the galaxy shows off a tiny dust lane, and I almost convince myself I’m seeing that with the C8/Stellacam tonight. 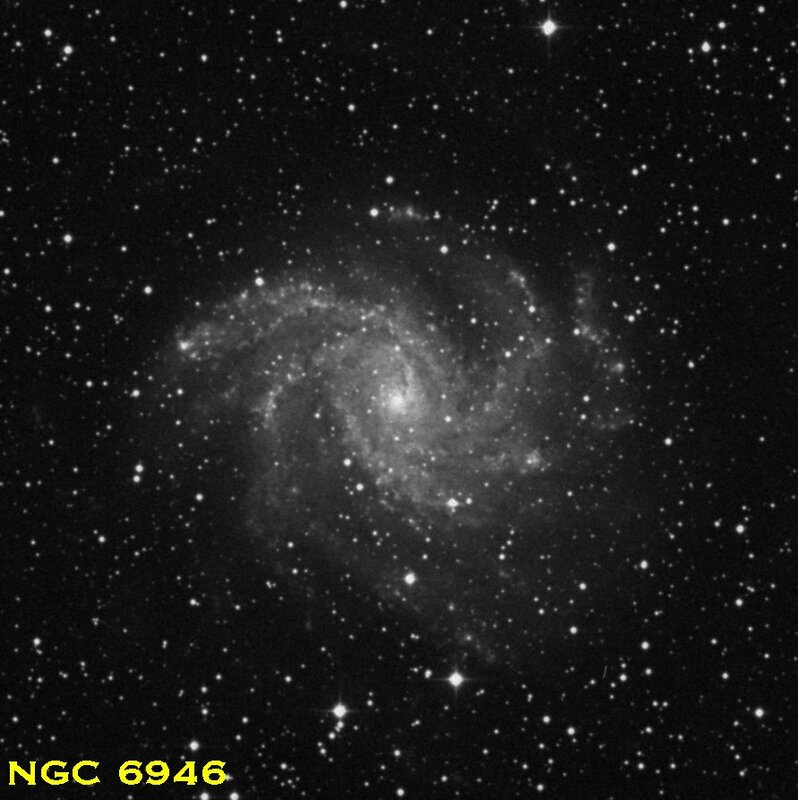 NGC 7497 (H.III.303) is at magnitude 13 and subtends 3.4’ x 1.1’. It’s an intermediate inclination Sc. What it looks like to me is a tiny M82. There is some dusty looking detail visible in the POSS image and on my monitor, but I think this “M82 look” comes from the fact that there is a magnitude 15.6 star about 30” southwest of the bright, small nucleus, and the two create a false “dust lane” between them. NGC 7681 (H.II.242) is a dim one, a magnitude 15.7 S0 lenticular. It’s relatively small, too, 1.5’ x .8’. A double star is 2’20” to the east and there is a faint, magnitude 16 star about 20” to the northeast of the galaxy’s center. Onscreen, the galaxy is a small, slightly elongated bright spot with slight hint of nebulosity around it. 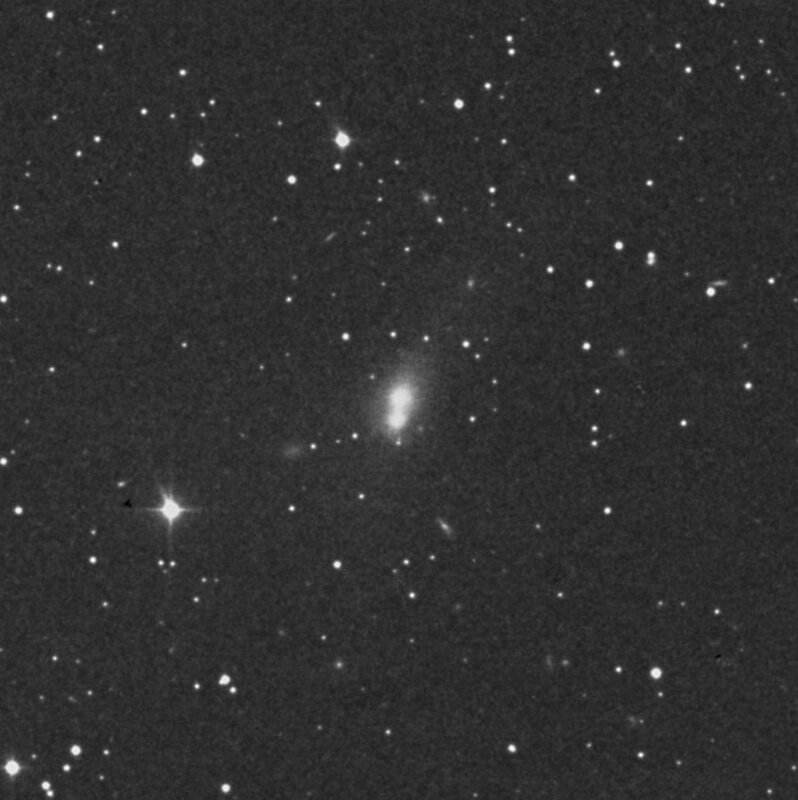 An E type elliptical 1.7’ x .9’ in size, NGC 7647 (H.III.473) shines weakly at magnitude 14.6. With the Stellacam, it is a slightly elongated fuzzball that’s redeemed by the presence of several small galaxies in the immediate area. 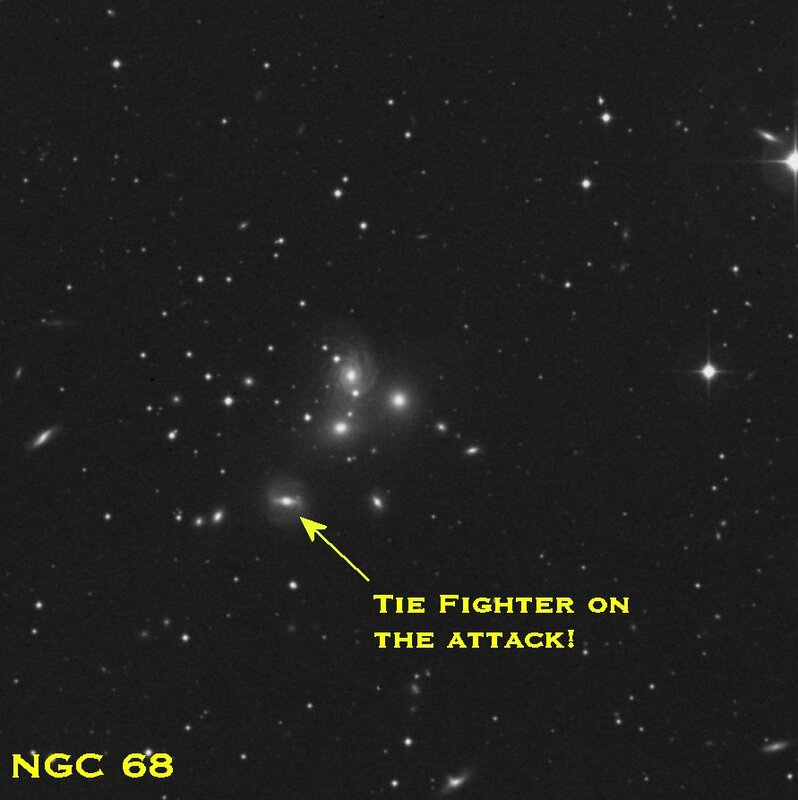 Collectively, this group is known as Abell 2589, or, to be exact, “ACO 2589” in recognition of the fact that the catalog of galaxy clusters done by George Abell was extended by Conwin and Olowin. After Triangulum, we headed to nearby Aries. Aries? Yep. You mean you didn’t know this small “forgotten” constellation is just chock-full of island universes? Is it ever. There were enough that by the time I got to the end of the Ram’s Herschel riches the night was growing old and the air was growing cold. In other words, it was REBEL YELL TIME. 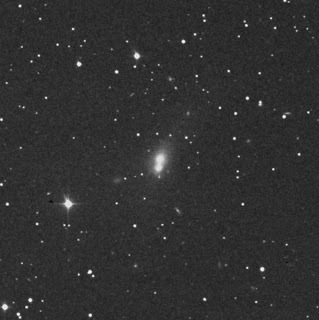 Before tearing down, I did take a minute or three to have a look at this fall’s little hit of a comet, Hartley 2, as it drifted along not far from the Double Cluster. As you can see in this single-frame Stellacam snapshot, it’s a nice one. Bright little nucleus, some coma, and even hints of a tiny little tail. It was almost as outstanding visually through my buddy Jason’s NexStar 11. Be sure to get out and have a look at it this coming week, y’all. Sky and Telescope’s website has finder charts and other cool Hartley stuff for your perusal. Takeaway this time? Obviously, I've still got some work to do with All-Star. No, I don’t really need to use it, but now it’s an ISSUE with me and I won’t be happy till it is conquered. Otherwise? I am continually amazed at how downright powerful my C8 and CG5 and Stellacam are. It’s often said a Stellacam (or Mallincam) can effectively triple the aperture of a telescope, but what I’ve learned while going through the Herschel 2500 is that the video advantage is considerably greater than that. I’ve seen detail in small, dim galaxies from our less than pristine skies the likes of which I have never seen visually in a 24-inch telescope. Not that I eschew the visual. That is still a big part of the Herschel Project and will continue to be so. I hope to get out to the PSAS darksite this coming weekend with my 12-inch Dob, Old Betsy, and get her tuned up and ready to go for the Deep South Regional Star Gaze, which will be four nights of visual Herschel heaven. Psst, buddy! Got 99 cents? Got an Apple handheld—an iPhone, iPod (Touch), or iPad? If the answers are “yes,” man do I have an astronomy program for you! 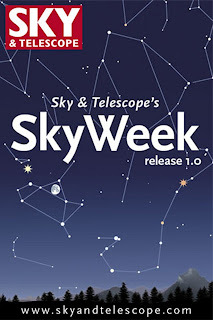 The good folk at Sky and Telescope have just released their first app, SkyWeek. What it is is a little program that connects to the Internet and downloads all the information you need to know about the week’s observing events. It’s like the “Observing” pages from the Sky website, but better, since you can carry it around with you. What do I like about it? There’re beautiful star charts and glitzy things like an animated Lunar phases screen and cool graphics of Jupiter’s Great Red Spot and Moons you can step forward and back in time. Best of all, it’s easy for computer ignorant old Unk to work. Just download it from the app store using either a PC and iTunes or the handheld, and tap the purty little icon. As long as you’ve got location services turned on in your device, SkyWeek sets date, time and location for you and all you have to do is enjoy. 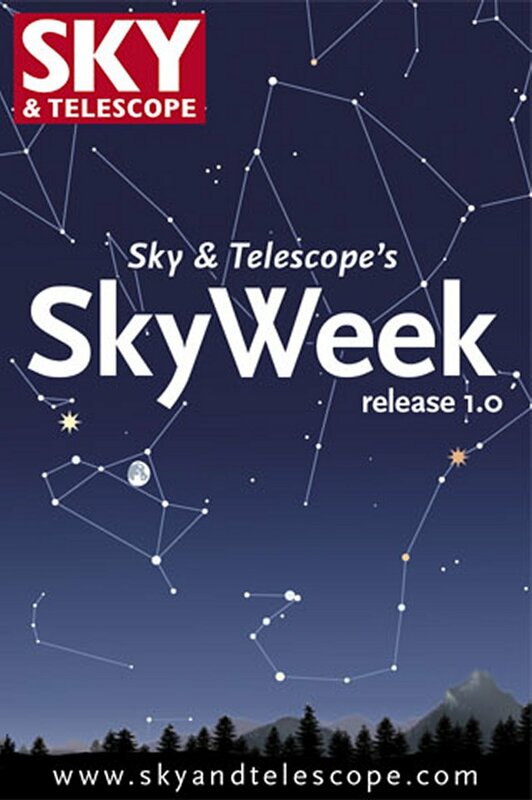 Given that my memory ain’t what it used to be—if’n it ever was—SkyWeek will go a long way toward seeing I don’t forget upcoming astronomy events. Now, if the Sky and ‘Scope folks could just develop an app to help me remember to bring my eyepiece case along when I go observing, I’d really be in business. If you’re an Apple user, don’t ruminate on it; just get this 99 cent wonder. You’ll thank me later, muchachos. 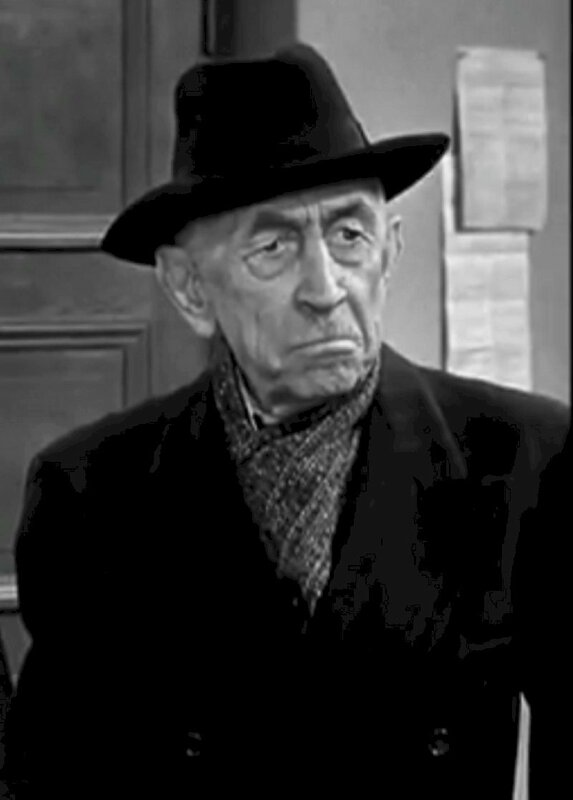 "You say this is the way we recruit new amateur astronomers? I don’t want any more amateur astronomers. The club observing field is too crowded now!" "It’s too much trouble to organize dadgummed public star parties." 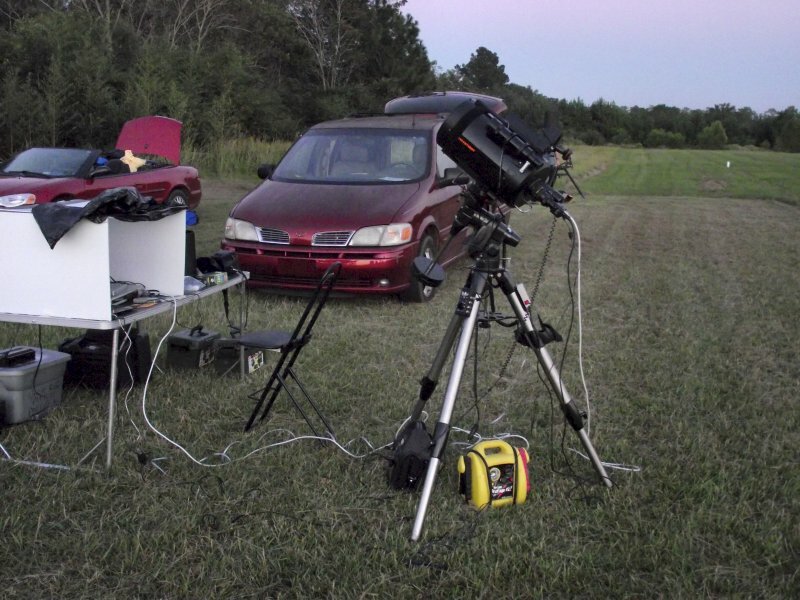 "We don’t have anywhere to hold a public star party." "The place where the club is having the public outreach stuff is too light polluted, and there’s gonna be a fat moon in the sky on the date the idiots have chosen!" "The kids ask too many questions." "Those nasty tykes with their lollipop-sticky hands and teenagers with caked-on makeup will ruin my expensive eyepieces." "Today’s kids are out of control. First thing that’ll happen is one will run helter-skelter into my beautiful AP refractor." "They won’t be interested anyway; they hate science. All they like is them consarned video games." 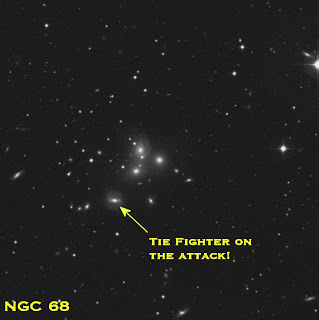 You say this is the way we recruit new amateur astronomers? I don’t want any more amateur astronomers. The club observing field is too crowded as it is. I’ve yet to be a member of a club where the observing field—or even the monthly business meeting—was “crowded.” But even if yours is, there are still reasons to bring new amateurs into the fold. None of that strikes a chord? Well, you like gear don’t you? Plenty of new telescopes, and eyepieces, and widgets of every description to drool over and sometimes buy? Imagine how much more of that there would be if we had twice as many amateurs as we do now. It’s too much trouble to organize dadgummed public star parties. Getting one together can be a lot of work—but only if you let it. Most of the time you and your buddies won’t have to do any organizing work at all. 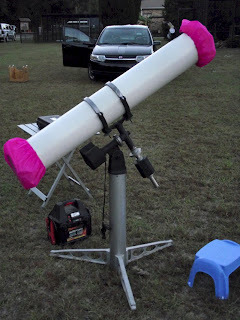 You can do as we do and hold your star parties in conjunction with the local school system or a similar outfit. They handle the venue and the publicity and all we have to do is show up with our telescopes. We don’t have anywhere to hold a public star party. As above, you let somebody else find a spot for you. That is, you set up on the grounds of your sponsoring organization: in the schoolyard, the back forty of the children’s science museum, the parking lot of the church, whatever. The place where the club is having the public outreach stuff is too light polluted and there’s gonna be a fat moon in the sky on the date the idiots have picked! Yes, the elementary school playground is probably ringed with sodium vapor streetlights. But so what? It really doesn’t matter. 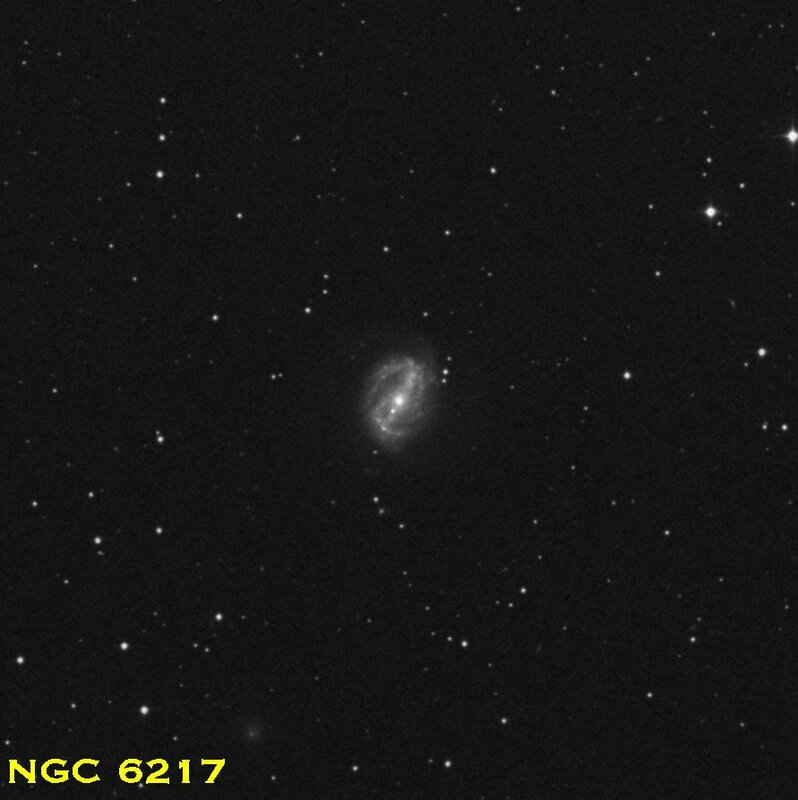 The public, kids and adults, don’t care pea-turkey about looking at NGC 7817, your favorite 12th magnitude galaxy. They want to see the Moon, a planet, and maybe a bright star or two. The combination of the public and lots of telescopes is one that goes better with a little ambient light, anyway. You don’t want little Suzie braining herself on the pier of your AP1200 GEM, do you? Don’t answer that, Ben! The solution? If you don’t want to embarrass yourself in front of a horde of six-year-olds, decide in advance which objects you will show, and bone up on them. It is not going too far to suggest you put some facts and figures on note cards. If you have a go-to scope, the hand control probably has plenty of information about whichever object you are sitting on, and the small folk will enjoy reading (or listening to you read) the facts of the matter off the little computer. It’s too boring. I have never, ever found teaching astronomy to kids to be boring. They are always full of surprises, and most often I mean that in a good way. There is nothing at all boring about their looks of wonder when they see the marvels of the night sky through a telescope, your telescope, for the first time. I’m too busy. I’m busy. You’re busy. We’re all busy. You mean to tell me you can’t get ONE NIGHT OFF from whatever you do to bring astronomy to your community? You don’t seem to have any trouble taking off a couple of weeks every summer and heading to the Texas Star Party. It could be argued that showing the public the sky is, in the larger scheme of things, more important than you doing the TSP Crazy - Hard Object List every single year. Those nasty kids with their lollipop-sticky hands and teenagers with caked-on makeup will ruin my expensive eyepieces. I’ll admit I wouldn’t want the eyelens of my 13mm Ethos coated with teeny-bopper mascara, either; even if no permanent damage were done. But that’s no excuse for not getting out there with the public. If you’ve been in the game for a while, you undoubtedly have a drawer full of inexpensive Kellners and Plossls that will perform more than adequately. Worried about your scope, too? If you don’t have a second and less fancy instrument, it’s inexpensive to pick-up a used rig for use with the kids. They will be just as happy with a 6-inch Orion Dob as they would be with your prized AP 150 caviar-refractor. Today’s kids are out of control. First thing that happens is one will be running helter-skelter and will knock over my telescope. Translation: YOU KIDS GET OFFA MY LAWN! As we get older, it’s tempting to blame the younger generation for all the things we perceive as wrong about our culture. Our parents did it…theirs did…and on and on. What we are really feeling is the melancholy that comes with knowing that the torch is being passed to the next generation(s), and that we are no longer the end-all and be-all of existence. That’s particularly difficult to face for us spoiled baby-boomers. Most kids are well behaved; it’s usually the parents that cause problems. They won’t be interested, anyway, they hate science. All they like is them consarned video games. The ground truth? Kids are a little different today. They grow up in families different from what you remember from Leave it to Beaver (actually, the Cleavers hardly represented the average 50s family). But they are smart. At least as smart as we were, if not smarter. And I see one thing semester after semester: computer games or no computer games, kids are still interested in the Great Out There. They don’t have a manned space program (much of one, anyway) to light the fire as we did, but they are every bit as excited about getting a look through a telescope as we were. Still skeptical, Ben? The idea of showing the stars to 300 kids is still—admit it—a scary one? No need to be afeared. 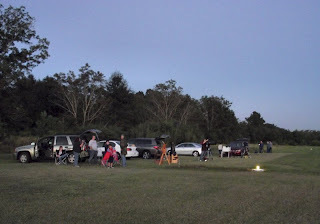 Let me take you through a typical public star party run, one me and my mates in the PSAS, the Possum Swamp Astronomical Society, did a couple of weeks back. 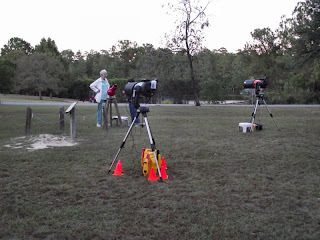 Not only do we hold our star parties in cooperation with the local school system, we’ve been lucky enough to be able to hold them at the same, excellent public school venue for over two decades. It’s no secret to anyone inside or outside the state of Alabama that education is strapped for money here. It always has been, with public schools never having been the highest priority for our politicians. Nevertheless, the county schools down here in Possum Swamp have, by Herculean effort, managed to build and hold onto an Environmental Studies Center in the suburbs. Oh, the (elected) schoolboard has tried to shut this “frill” down a time or two, but the Center, its dedicated staff, and we--the PSAS--are still here. Honestly, I can’t think of a better place to hold a public star party. While the “ESC” is now in the midst of plenty of suburban street lights, the lighting on the beautiful, park-like grounds is sparse and sensible, so ambient light is not a problem. It’s certainly worth putting up with the general light pollution to have a modern classroom/laboratory building at hand (with its all important bathrooms and coke machines). Having the ESC folks available to handle all the logistics is another huge plus. 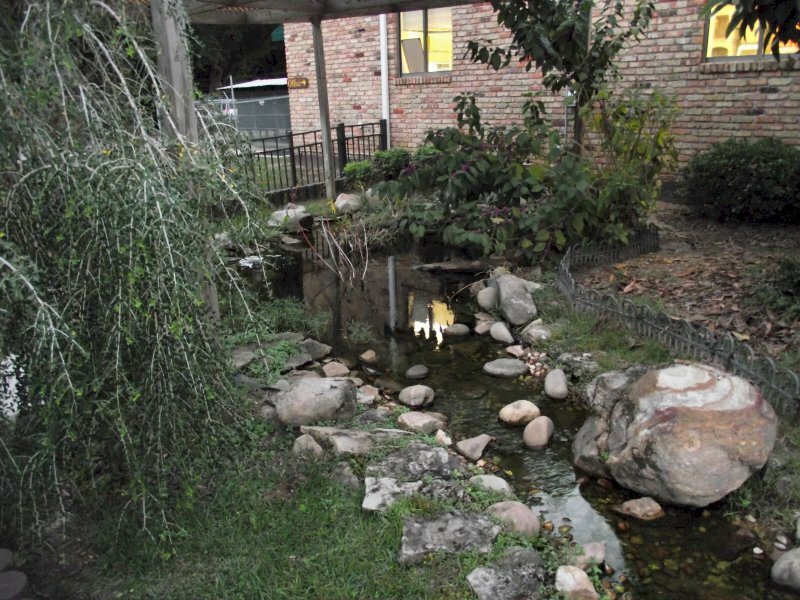 Most of all, though, every adult Possum Swamp native has visited the ESC during their schooldays, so it’s a warm and friendly place they are eager to return to with their kids. Telescope? As I have said before, I believe simpler is usually better—up to a point. I leave the go-to rigs at home. Thing is, as soon as the Sun is down—or even before—your “customers” will begin to arrive and will want a look at the Moon right away. 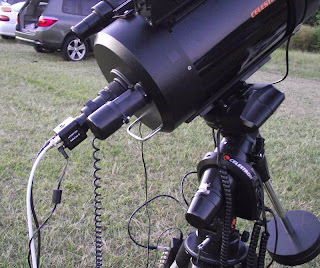 Some go-to scopes can skip alignment or be aligned well enough on the Moon so they at least track, but what’s the point of having a go-to rig if you do that? How useful will go-to be, anyway, even if you do have time to get the mount properly aligned? You ain’t gonna be hunting 14th magnitude galaxies on a public night. 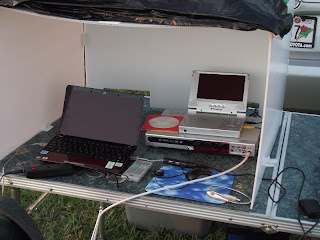 A computer scope is also more time-consuming to set up and is festooned with cords, buttons, and switches that may prove irresistible for little fingers. How about a Dobsonian? I’ve used Dobs at public outreach events, but have never felt they provide a good experience for the lollipop brigade or for me. I spend too much time re-centering objects between observers, and a Dobsonian is way too easy to move off target by the small, eager hands that will inevitably clutch the focuser despite my pleas of “Look, don’t touch!” A really big Dob? Fuhgeddaboutit. Do you want seven-year-olds climbing your orchard ladder in the dark? My scope of choice? My trusty RV-6 Criterion Dynascope Newtonian, Cindy Lou. This 40 year old trouper has everything you need for a public star party: excellent optics, a clock drive, and an interesting appearance. I do have to provide a stepstool for the wee-est of the wee to reach the eyepiece, but that is not a big problem. 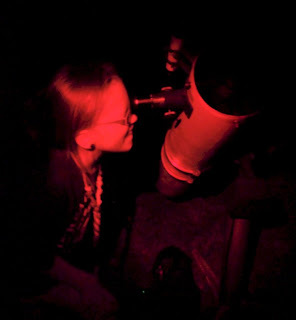 Usually, thanks to the scope’s tube rings, I can position the eyepiece so most of my young observers can observe flatfooted on the ground. It’s not just ergonomics, either. Point an old Dynascope or other Newtonian refugee from the 1960s at the Moon, and not only will your audience be gobsmacked, you will be too if you’ve forgotten what a beautiful job these antiques can do. Don’t have one? They, and especially the Dynascope RV-6es, are often no farther away than a local Craigslist ad, where they can usually be had for a song. First thing I noted after I’d got the RV-6 out of the car and set up? 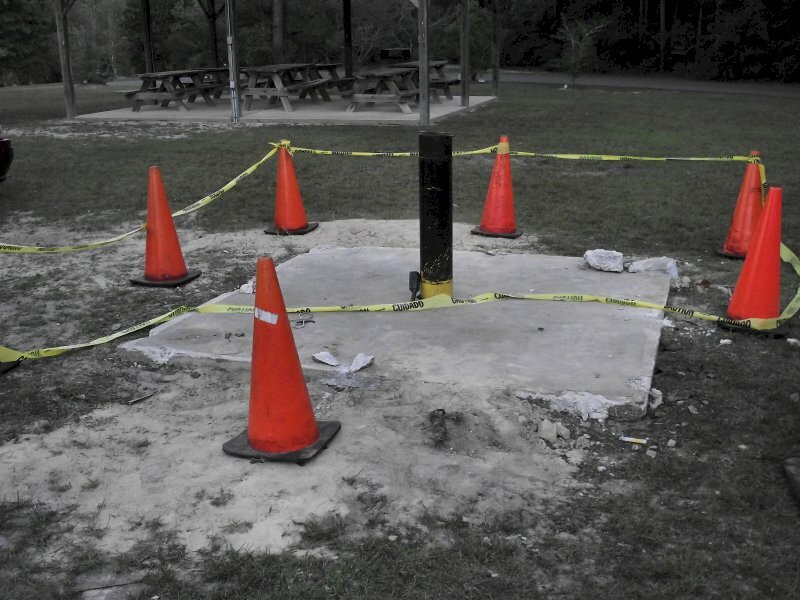 The ESC had finally got around to tearing down the PSAS’ old roll-off-roof observatory. In truth, it was time. Our little observatory was pretty dilapidated after enduring two decades of Gulf Coast summers. We’d kept it painted and in repair for many years, but lately? Not so much. We’d originally intended to use it for public outreach with our 12-inch Cave Newtonian, but that never worked out. Kids had to climb a ladder to reach the eyepiece and, as with a bigdob, you don’t really want them doing that. 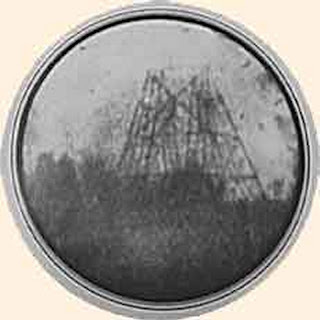 Also, most members wanted to use their own scopes at public nights rather than open the observatory, sweep the spider webs away, get the humongous 12-inch going, etc. I have preserved the big Cave GEM mount for possible future use—a tornado strike on the ESC did-in the OTA some years ago, alas. Hokay, status check. 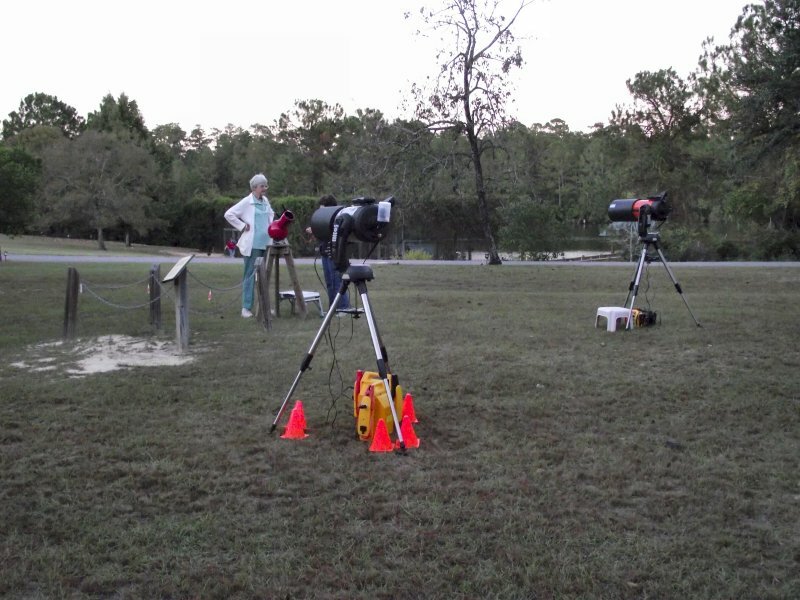 We had six telescopes set up and ready to go. I figured that might be barely enough. The last thing you want is too-long lines, though short ones actually seem to increase excitement and anticipation. If we were deluged with kids, I had Anita, the ESC’s newest and very enthusiastic teacher and also a brand-new PSAS member, standing-by with an old Meade white-tube Dobbie. By the time the Sun was down, I had the RV-6 on Luna, she was delivering an absolutely beautiful image, and a line was forming at my scope. Not because the ESC staff had herded the kids and parents into a line; they organized themselves. Our customers were polite and well-behaved, and that has been the norm over the years. The only times things have gotten dicey in that regard have been when we were completely overwhelmed during special events—Lunar eclipses and Comet Hale Bopp. In those cases, the fault was ours. You simply cannot handle crowds approaching 1000 comet-crazy civilians with ten telescopes; we should have been better prepared. My targets? I stayed on the Moon most of the time, since that, again, is what the kids and their elders most want to see. I did shift over to Jupiter for a while, though. The seeing wasn’t good enough to allow Jove to really strut his stuff, but our guests didn’t much care. They were enchanted by the Galilean moons (one tot, not surprisingly, asked me which moon was the biggest and how big that was, but I was PREPARED) and by “Jupiter’s ring” (the NEB). By 8pm, I was on the road back to the Old Manse with the RV-6 and sure didn’t feel like I’d foolishly sacrificed my evening on the altar of public outreach. I’d had a good time, as always. Would I like to do once-a-month public star parties? 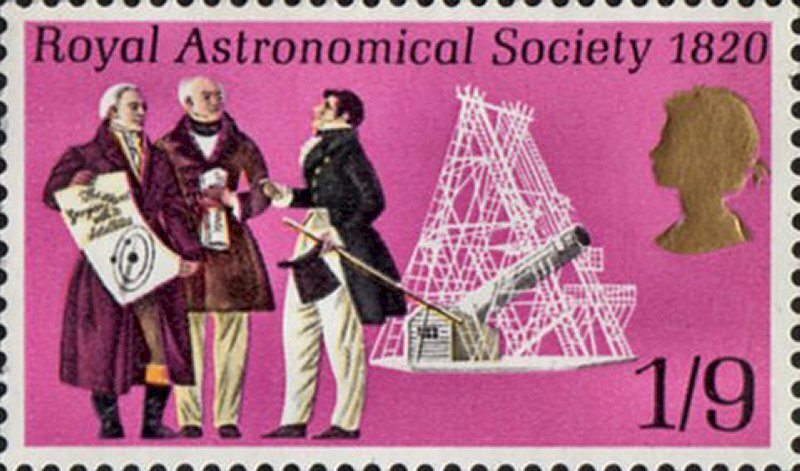 I don’t know about that, but twice a year is simply not a huge imposition, and I believe, frankly, that we’ve done some good for kids and for amateur astronomy over the last twenty years. So there you have it, Mr. Weaver. Wasn’t so scary was it? No scopes were trashed. Plenty of excited kids looked at the Moon and Jupiter. One day, as you (and me) run aground on the shoals of old age, you may even find yourself looking through the giant computer-festooned telescopes of kids who got their start as amateurs on this night. Thinking back to those old Andy Griffiths, by the end mean old Ben Weaver always showed he really had a Heart of Gold. It’s been this old boy’s experience, muchachos, that at the end of a public outing most astronomer-curmudgeons can’t stop talking about the look on that six-year-old girl’s face when she saw the craters of the Moon for the very first time.